The Wikimedian-in-Residence initiative aims to encourage staff and volunteers at organisations — typically Galleries, Libraries, Archives and Museums (the so-called GLAM organisations) — to share their knowledge and resources with the world, using Wikipedia and its sister projects as a platform. The millions of items currently in the National Library of Scotland’s collections are accessed by a relatively tiny readership. In the past five years, the Library has made a concerted effort to provide more digital material online for free, and it has rapidly seen a huge increase in the number of users reached on a regular basis. However, these numbers are still small when compared to the billions of monthly page views averaged on the English language Wikipedia alone last year. It’s no longer possible to ignore the overwhelming impact that Wikipedia and its sister projects — for example, Wikimedia Commons (an online repository of media files), Wikisource (a free content library of source texts), and Wiktionary (the name speaks for itself) — have on public access to knowledge: Wikipedia is often the first port of call for casual information. As the Wikimedia Foundation continues to focus on improving research and citation standards and the overall quality of articles, the extent to which it becomes trusted as a reputable source by cultural and educational institutions seems to grow day by day. 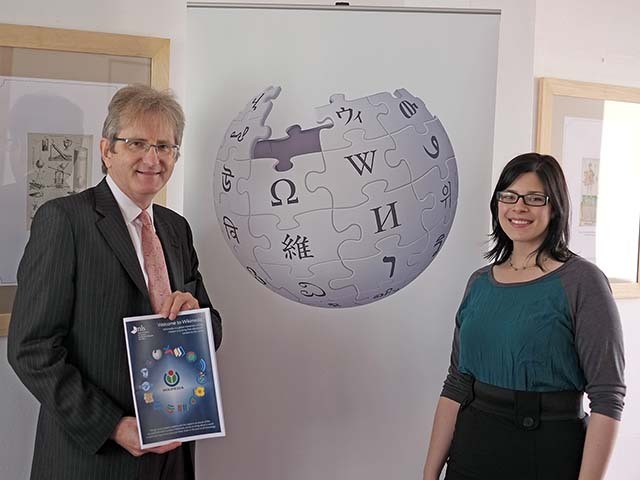 As Wikimedian-in-Residence, I’m working with the NLS as part of this strategy: joining forces with Wikimedia projects means improving the quality of those projects while at the same time raising the profile of the extensive and valuable digital resources already provided by the Library. The residency is also part of a drive towards open access across the Library more generally, and contributes to that momentum. On 4 October, the NLS will launch the first ever ‘Wiki&Biccy’ session, an informal gathering inspired in equal parts by Wikimedia meet-ups and knitting circles. Staff, Wikipedians, and interested members of the public are invited to stop by the NLS Boardroom in the George IV Bridge site to ask questions, work on an article, get advice, chat, and — as the name suggests — enjoy baked goods. On 19 October, the first NLS-hosted edit-a-thon will focus on Early Photography in Scotland, aiming to share information about Scotland’s place in the history of photography in the later 19th and early 20th centuries. I am always looking to hear from Wikipedians in Scotland, or anyone who might be interested in getting involved in future events and initiatives. More details can be found on our GLAM/NLS project page, and I do hope to hear from many OKFN Scotland members!